Sound "An ideal contradiction" -- "not bright or dull...not forward or relaxed -- very even-sounding overall"; "all types of music sound alive and well on this speaker"; but "ultimate [bass] weight and impact are compromised" -- no surprise. but the off-axis response too." Use "According to Amphion, the acoustic center of the speakers (i.e., where your ears should line up) is the mid-point of the woofer and tweeter," so Doug used 26" stands. Value "In the end, the argon2 is splendid to look at, wonderful to hear, and priced almost too low to believe considering all it offers." Its no secret that Im a big fan of two-way minimonitor loudspeakers. Among the things this means is that I probably have the largest number of speakers on the market to choose from because almost every company produces at least one applicable model. Among the reasons for the popularity of the minimonitor, and my innate interest, are the advantages inherent in the design. Minimonitors feature relatively small enclosures that dont have to cost an arm and a leg to build; there are normally only two drivers used, which keeps costs down and simplicity high; and finally, the size and output characteristics usually mean room placement is easy. You can get a lot of sound -- admittedly at the expense of truly deep bass and often large-scale dynamics -- for not a whole lot of money. But dont let such two limitations sway you just yet. Depending on your room, you may not be able to use all the bass a big speaker can produce anyway, making a smaller two-way the perfect choice. In fact, Ive heard properly set up, inexpensive bookshelf speaker systems clean up on floorstanding systems costing thousands more. Amphion is based in Finland, and when I first saw their speakers at the High End show in Germany, I was intrigued by the flaring front baffle -- it was an indicator that there was more to the argon2 than met my eye. I sat down for a listen, and my initial impressions were positive. I then talked to the Amphion staff about the company's design methodology, and this really perked me up. The argon2 is the successor to the companys original argon speaker and uses a 1" aluminum-dome tweeter and a 6.5" aluminum woofer in a gorgeous-looking cabinet. Amphion crosses the tweeter over to the woofer at 1200Hz. This is the lowest Ive encountered in a loudspeaker Ive reviewed. It also raised my eyebrows a bit because usually when you try to bring the tweeter down too low, distortion and power-handling problems can arise. However, Amphion says theyve overcome these. Still, it begs the question: Why are they doing it? According to Amphion, one of their goals is to get the crossover out of what they consider a critical range of human hearing: 2kHz to 5kHz. This, they feel, is where the ear is most sensitive to anomalies that crossovers can cause. Keeping crossover elements out of critical frequency regions isnt new; other companies try to do it too. But instead of riding the tweeter down low like Amphion is doing, most will make use of the woofer driver (or midrange driver in a three-way design) and push that higher in frequency. Amphion also touts something they call Uniformly Directive Diffusion. What this pertains to is the off-axis response of the speaker. Essentially, the company is trying to optimize the response heard at the listening position by concerning itself not only with the on-axis response (the direct sound from the speaker), but the off-axis response too (the sound that reflects off walls, floor, ceiling, etc.). Its the sum of the direct and reflected sounds that creates what you hear in your listening chair. The guys at Amphion joke that some loudspeakers off-axis response curves "look like the Swiss Alps." Amphions own goal is to have output decrease as frequency increases and continue to do so the further you get off axis. The tweeters crossover frequency is important for this goal too because the driver has inherently wide dispersion. Woofers have good dispersion too, provided that theyre not forced too high in frequency, where theyll start to beam. Thats the problem some companies have when they push their woofers up too high. Bringing the tweeter down as low as Amphion does -- providing you dont have distortion and power-handling problems -- gives you wide and even dispersion that integrates ideally with the woofers own dispersion pattern up to that frequency. The argon2 is average in size for a bookshelf loudspeaker, measuring 15" high by 7 1/2" wide by 12" deep. You can get it with or without real-wood veneers. On my review sample, all sides except for the front are veneer over MDF. On the front, Amphion uses layers of wood that are glued together to run deeper around the tweeter area. Doing this allows the company to carve out that flare and recess the tweeter. I suspect that this flaring front baffle, which horn-loads the tweeter to a degree, is instrumental in allowing Amphion to cross over the tweeter so low. Overall, the speaker is splendid to look at, and all aspects are finished to such a high level that I would have suspected that the speaker costs more than it does. The port is on the rear, more or less behind the tweeter. There are dual sets of binding posts to allow biwiring (although I jumpered them and used a single set of wires). There is no grille, meaning you will be looking at drivers all the time. Be thankful for the elegant design. Amphion rates the argon2, which is magnetically shielded, as having a sensitivity of 85dB and a nominal impedance of 8 ohms with a minimum dip to 7 ohms. Frequency response is said to be 40Hz to 20kHz. 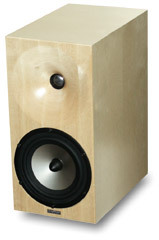 The veneers I mentioned are birch and cherry -- speakers finished like this carry a premium price of $1420 USD per pair. The non-veneer version in either silver or black is only $1265 per pair. The warranty is five years. I used my standard review system, consisting of Blue Circle Audio BC2 mono amplifiers, BC3000 preamplifier, and Theta digital separates (Prime II DAC and Basic transport), to evaluate the argon2s. Interconnects were Nirvana S-L series, and for speaker cables I used Nordost Red Dawn II in the beginning and switched over to Nirvana S-L series speaker cables later on. Setup was a snap. I sat the speakers atop 26" Osiris stands that put them at the perfect height for my listening chair. According to Amphion, the acoustic center of the speakers (i.e., where your ear should line up with) is the mid-point of the woofer and tweeter. I used about 10 to 15 degrees of toe-in for each speaker. The sound of the argon2 is an ideal contradiction. On the one hand, the argon2 sounds exceedingly neutral -- no one area jumps out, and nothing sounds recessed. Its not bright or dull, and its not forward or relaxed -- very even-sounding overall. But this does not mean its sound is boring and sterile. Quite the contrary. The argon2 is also rich and full, and is seductively smooth through its entire frequency range. Its shy of the deepest bass notes -- to be expected given its smallish size -- but in a small or mid-sized room, it delivers more than sufficient weight for purist music listening. Its exact and precise, but its also alive and engaging. It achieves a delicate balance that is oh so rare in many loudspeakers and is unexpected at this price. Its not perfect -- you may want a little of this and a little of that -- but it gives a lot. And a very important trait for me is that all types of music sound alive and well on this speaker. Theres a great scene in David Lynchs film Mulholland Drive where the two lead female characters visit a club called Silencio. Its here they watch a woman lip-synch a Spanish-sung a capella version of Roy Orbisons "Crying" (called "Llorando," with Rebekah Del Rio credited as the singer). Its a captivating screen moment and the sole reason I bought the soundtrack CD [Milan 35971]. The song has a tremendous amount of hall ambiance (likely a combination of real and artificially created), and it was one of the first things I played on the argon2s. Del Rios voice soars out of the cabinets and is placed rock-solid in the center and just back of the speaker plane. The voices origin is absolutely minuscule -- as it should be, but something few speakers achieve. The ambiance extends to the width of the speakers and then far behind. It makes for a wholly convincing stereo presentation. The recording is not as pristine as it could be, but when Del Rio cuts loose and her voice gets very loud toward the end, the speaker plays to high volume levels without compression or audible distortion. Sibilance thats inherent in the recording is not reduced, but more importantly, it's not exaggerated in any way either. Impressed, I played an older favorite, the soundtrack to the 1986 film The Mission [Virgin 90567-2 ]. The music on this is mostly large-choral and orchestral arrangements, and its been a startlingly good demo disc. This recording is hardly a thing of perfection either, but as my system has gotten better, Ive been amazed at just how much there is in the bits of this disc. The argon2 has excellent resolution that displayed a huge and layered soundstage with voices that literally hovered in space. Image placement was wonderful in terms of front-to-back and left-to-right specificity. Hall ambience made the stage seem enormous, and the sound of the male voices was clean with excellent weight and presence. If you could freeze the sonic image in space, you could count each one of the many voices. People who like minimonitors for the precise way they can present a recording will love the argon2. The main drawback came on orchestral climaxes. Like all smaller speakers, only so much air can be moved by small drivers in a small box, so ultimate bass weight and impact are compromised. Still, I consider this a small price to pay because it's offset by what you get in other areas. I next cued up Sarah McLachlans The Freedom Sessions [Arista 18784] for an even more vigorous workout with the argon2s. This is a very raw recording -- it's the demo and practice takes for Fumbling Towards Ecstasy, and it has little, if any, post-production editing. Dynamics on this album are not compressed, instruments are mainly acoustic, and most songs have tremendous frequency extension, up high and down low. Sometimes the most surprising recordings make the best demonstration material. "Hold On" has some interesting errors in the recording that can be used to see just how revealing a component is and how precisely it can image. At the beginning of this track, McLachlan's voice is too far left. Past the one-minute mark you can hear the correction being made (presumably live during the recording session). With the argon2, I could hear the discrete image-placement corrections being made with startling precision. Whether its this track or any other with a precise stage, these speakers show impressive resolution and can image with remarkable precision. Imaging is one thing; how a speaker does with instruments and voice is another. McLachlans voice on this same track sounds wholly natural with an ideal amount of detail balanced with an element of richness and vibrancy. Her piano has enough robustness to give it a grand sense of scale, but with sufficient detail and control to convey all its texture. Bass is fairly deep and nicely fleshed out. The argon2s low-end rating is realistic with careful room placement. Plus, these speakers can play LOUD. Although I mentioned that smaller speakers, like these, are compromised in presenting large-scale dynamics in comparison to huge speakers, this doesnt necessarily mean theyre delicate little flowers that can only play quietly. You can crank these babies up to impressive volume levels, and instruments remain clean and well delineated. Although I always I caution about putting speakers like these in too big a room, given the impressive levels I achieved, its at least worth trying with the argon2s if you have such a room but want smaller speakers. Hearing Willie Nelson sing Cindy Laupers "Time After Time" on his new The Great Divide [Universal 586231] album is a little odd, but if Miles Davis can do a great job of what we all thought was a meaningless mid-80s pop hit, why shouldn't Willie try? I had become familiar with this disc on the $995 nOrh SM 6.9 loudspeakers, and the difference between these speakers proved interesting. The nOrhs have a beefed-up lower midrange and bass sound that adds more weight and presence to the recording. The result is evident in Nelsons voice, which gains additional richness and vibrancy. The nOrhs also produce more wallop in the bass -- they dont necessarily go much, if any, deeper, but where they connect down low, they convey it with more impact. Despite the thrills that the SM 6.9 conveyed, the argon2 proved to be the more balanced of the two. Nelsons voice through the argon2 sounded more laid-back in comparison (but this is not a laid-back speaker; rather, the nOrh is more up front), and the detail and texture were easier to discern. Left-to-right imaging through each speaker was comparable, although the argon2 cast a far tighter image. Depth of stage is where the argon2 really shone, with an almost limitless back wall. On the final track, "You Remain," the argon2 presented the upper-midrange area in a more full manner, and the highest frequencies were a bit more refined and airy. The SM 6.9 is large and exciting, while argon2 is a little more relaxed and precise. In the end, these are two very different speakers that will gain different fan bases. Besides the nOrh SM 6.9, the most logical comparison I could find for this speaker is to one thats a little more expensive -- Revels $2000-per-pair Performa M20 -- and this speaks highly for what the argon2 achieves. I chose this speaker for comparison because in ways, the argon2 is a lot like the Revel. They both sound exceedingly neutral, and prospective purchasers who are considering one will want to consider the other. In terms of build quality, both are finished to a high level and represent first-rate bookshelf-sized speaker building. Whats interesting is that by default both dont come with grilles. The designers want you to see their baffles and drivers (an optional grille can be ordered for the M20 at an extra charge). The Revel is a little more techie-looking with its black, curved front plate and concave woofer. Its an eye-catcher. But the flared front panel on the argon2 is, to my eyes, more elegant. It doesn't jump out in quite the same way, but I appreciate it just as much. Both have real-wood finishes that exude a high level of quality. Cosmetically, it comes down to a preference thing. Both image with the best and cast a soundstage that is wide and deep. Its a toss-up in this regard and impossible to declare either a winner. The biggest difference between them will actually be your own skill in setting them up to get the best out of them. The Revel M20 is the leaner-sounding of the two. The highs soar, the midrange is incisive, and the bass is fast and deliberate (its also worth noting that all my auditioning of the M20 was in the "flat" position; however, there are treble and bass controls to alter the speakers balance a little to suit personal taste). Subjectively, the M20 seems quicker, and people who favor a very vivid sonic picture will likely want this. The argon2, while not quite as visceral, has a little more fullness, bloom and romanticism about it -- not a whole lot (the nOrh has considerably more), but compared to the Revel, it tilts that way. Audiophile terminology for it is "more musical," and therein lies the biggest difference. I always tell people that the M20 is like a laser. It has precision that shears through a recording. Its able to dissect a disc before your ears. But as one friend who also admires the M20 said, "For all the strengths it has, it renders music a little too clinically for some." Too honest? Perhaps, and thats where the argon2 steps in. The argon2 is a wonderful combination of precision and musicality -- essentially the best of both worlds and something I hadnt found in a bookshelf loudspeaker near this price. It can unravel an extraordinary amount of detail and can image like anything, but its not the kind of analytical speaker that can be fatiguing. It has a natural ease and a room-filling sound that are captivating, and its the perfect speaker for people who want almost all the detail a minimonitor can give but also want to be able to sit back and enjoy it for hours on end. Properly set up in the right-sized room, the argon2s dont make you feel short-changed that youre listening to a small and relatively inexpensive speaker. Close your eyes and theyll disappear; youll realize they can play plenty big. In the end, the argon2 is splendid to look at, wonderful to hear, and priced almost too low to believe considering all it offers. Price: $1265 USD per pair in silver or black, $1420 per pair in birch or cherry veneer.